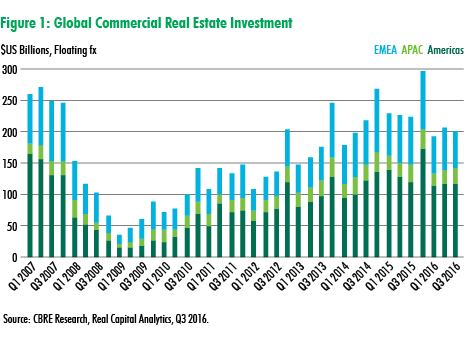 Global real estate consultant CBRE Group, Inc. is reporting this week that the worldwide value of commercial real estate investment transactions stayed above $200 billion in Q3 2016, suggesting that the market has stabilized after a drop in transactions at the start of the year. Globally, risk aversion among investors lowered transaction levels across all asset classes in the first half of the year. Bond and equity markets settled down in H1 2016, and this is also showing through in the real estate sector. 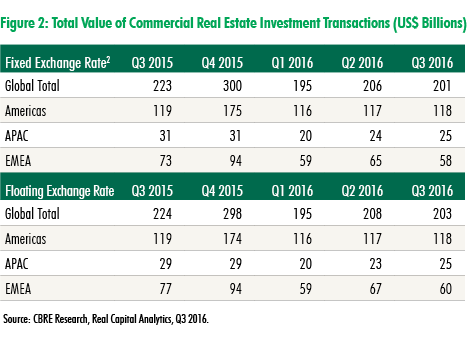 Quarter on quarter, transaction value1 was down by 1% in Q3 2016; versus Q3 2015, it was down 9%. Activity in the EMEA region (dominated by Europe) continued to show a downward trend, falling by 8% compared to Q2 2016 and by 18% compared to Q3 2015. Due to exchange rate effects, the EMEA decline is greater when measured in U.S. dollars, and particularly over the longer term–21% versus Q3 2015. Weakness in the UK market has been a significant driver of the drop in EMEA activity. Investment transactions have been slowing since mid-2015, but that trend accelerated in H1 2016 and continued after the referendum result at the end of June. Excluding UK transactions, EMEA showed a year-over-year decline of 14%.